Bendgate didn't make a return this year, fortunately! The iPhone 7 has only been out a matter of hours, and already it’s undergone its first torture tests, courtesy of YouTuber JerryRigEverything. After exposing his matte black iPhone 7 to various scratches, flames and bend attempts, JerryRigEverything comes to some interesting conclusions. Check out his iPhone stress test video below. So what did these durability tests reveal? For one thing, the iPhone 7 responds remarkably well to being burned. A black patch briefly appears on its screen when the iPhone is exposed to flames, but rapidly fades — and the touchscreen remains usable. The iPhone 7’s anodized aluminum case can withstand key scratches, but not razor blade cuts. The merciless iPhone abuser also suggests that no sapphire glass is used on the iPhone 7, since all glass surfaces incur scratches from just a midlevel hardness pick. This suggests just regular glass is being used, according to the YouTuber. The iPhone 7’s side buttons are metal, he notes, but its antenna bands are still plastic. JerryRigEverything also makes the interesting observation that using the same Lightning port to charge the iPhone 7 and pump music through the EarPods is a bad move, since it could double the wear and tear on the port. Finally — and unsurprisingly — there’s no repeat of the iPhone 6’s “Bendgate” phenomenon. Apple made efforts to eliminate that problem with last year’s smartphone refresh, adding additional supports inside the iPhone 6s handset. 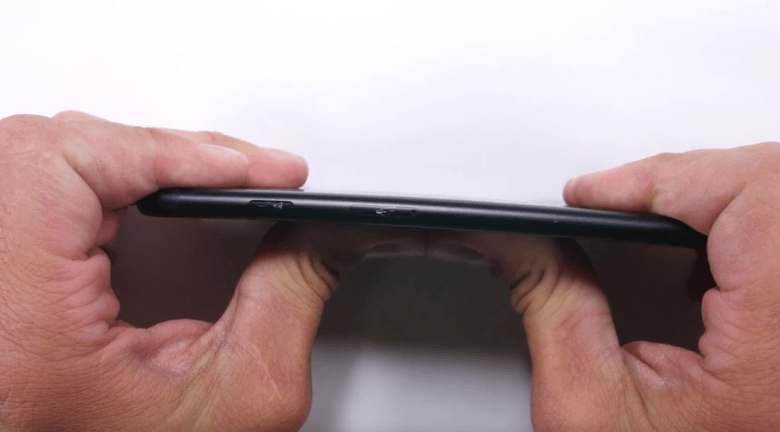 However, JerryRigEverything suggests that sitting on your new iPhone 7 is inadvisable, since it could have a negative impact on the extra waterproofing adhesives Apple has built into this year’s model. Between this and the great Australian iPhone 7 surf test conducted today at Bondi Beach, Apple’s latest smartphones are looking mighty durable. Are there any particular stress test vulnerabilities you’re concerned about with the iPhone 7 or the iPhone 7 Plus? Leave your comments below.